I originally tried to contact Jauani Wu early last year, because after all, it's not every day someone names an MMO guild after a French postmodern intellectual. But I never did get in touch with the founder of Second Life's Foucault Fan Club, because appropriately enough, he'd just quit due to philosophical objections. "My first time in Second Life," he tells me now, "I was kind of against it-- against the whole online community thing. As an architecture major, I was very idealistic about public space and embodied experience. I'm fairly phenomenological in terms of architecture, and so it affects a lot of my outlook on life. But during my thesis [graduate work], I think-- I'd like to hope-- that I've become less naive about these things, less of a technological substantivist." I feel the breeze of an unknown concept creating another part in my hair. "Substantivist"? "Oh sorry," Wu says, backing up. "Technological substantivism: that [technology] redefines meaning, shapes social and political practices, and that it is a non-negotiable force. So technology redefines what it means to be human." Since then, he's decided that "technology is here, and this is the society we live in, so it's more important to live through it then turn your back on it. I read a book by Andrew Feenberg this year which changed my outlook, and I did a lot of readings on cyber theories. But later philosophers like Foucault and recently Feenberg open that up and bring human agency back into the discourse. There are others, too, but those two I am more familiar with." "I didn't get the sense Foucault was about human agency," I observe cautiously. "More like how human agency is controlled by dominant social structures and hierarchies." But Wu is already at a full gallop with his original theme, and cannot be delayed. "I think the whole environmental movement, like Feenberg illustrated, is an example of how we shape our technology as well," he says. "So there is a feedback loop." "Yeah," I offer. "I don't mind getting shaped, as long as I get to throw in my two cents, know what I'm saying?" Jauani laughs. "Yeah. So as an undergrad student, I was very indignant about the whole computer mediation [thing]. But know it's more about balancing. There is an economy of scale that the Internet allows which is liberating in many ways." "The second time," he says, smiling sheepishly, "I got hooked... regardless of what I intellectualize, I can't help getting wowed by all the imagination and skill in here. I could say 'waste of time', but then the artistic side in me can't stop being amazed at all the creativity in here. And that most people are lay people who one year ago had little skills." For Wu's part, in his first life, he's soon to become a professional architect-- albeit one with a deep base of theoretical knowledge. And so we talk about the insights he gained before he left, and since he's returned. And why, for starters, he created a Foucault Fan Club in the first place. "I am really fascinated by the Foucault stuff I have read," he says. "Still digesting a lot of it." "Is that why you started the group?" "I remember in Beta there were was a lot of confusion," he tells me. "People were just starting to become savvy about information. I thought it was an interesting idea that we felt more comfortable navigating a virtual environment, which is essentially space-less, with a spatial interface. But the space was only representational, constructed on our screen, client-side, as a way to interpret the information. [A statement like] 'this is not a pipe' was kind of a superficial way for me to think of [what] the confusion was about." Since then, his in-world interactions have been less about the ontological quality of the experience, and more about its social character. "I've just become more involved in the whole culture of Second Life itself," he says. "The PG side, anyway. There's something unique going on in here and I'm more interested in that. Like people are willing to pay one US dollar for a virtual couch I made. The commerce in here indicates a degree of what's happening. Like [one of my in-world friends] sells jewelry-- she sells hundreds of United States dollars worth [per month]. I sell furniture, I'll be lucky to sell US$10 worth in a month. There's a utility to the jewelry in expressing oneself. Because this is in the most basic way a medium for human relationships. "It's an inter-subjective space. Nicola Escher pointed out some of these things in a commercial sense to me, about what sells and what doesn't. She was saying that avatar accessories sell, vehicles sell, [but] furniture doesn't sell as well [unlike] clothing, jewelry, other avatar modifications-- like Marcos' robots or vehicles, etc. They all allow a way for us to relate to one another. It's not about this being a medium to just create-- we could do that in 3D Studio Max, or Virtools-- it's that we can share it, too. So all of those avatar-related things that make Chip Midnight, Nephilaine Protagonist, Nicola Escher, or Caroline [Apollo] successful, they are involved directly or indirectly in communication." He points to a sleek couch on his balcony. "The people who buy my furniture (and they are rare!) adore it. They generally recognize them as Arne Jacobsen knock offs. And so it has a sign value for them, kind of like real life. "Some commercial successes you might want to look into are the dance machines." Popular in Second Life's nightclubs, these machines allow dancing avatars to sync up, so that they're moving in time with each other, and to the rhythym. "[One resident] told me she made L$100,000 in a matter of days, when she introduced one. [Another resident] made an instant L$100,000 by uploading tons of [custom] animations when 1.4 arrived." The unifying theme here, in all this commercial success? "These things are all about a public space. Now think of where most of us live. Sprawled out in North American cities. They are very anonymous. We are packaged into independent parcels of land. It's what we long for. It's the American dream." "Do you mean that ironically?" "Well, yeah. I mean, that is what we want. Freedom, our own kingdom-- and our expanses of land allow [for] it. And then in the comfort of our house, in physical seclusion, we reach out to the public space through the computer, the TV. Because the suburban dream was to get away from the city, all the hustle bustle, all the people… as soon as you are in touch with another person, you are limited in your choices. So I think this idea of freedom is one push to sprawl. In isolation there is freedom. "But we are fundamentally social animals. So in the move to the suburbs we became absorbed with TV, our access to the public, and now we have the Internet, a more discursive medium. And when you read the forum on Second Life, you can see the resurgence of this question of freedom. Every few weeks some threads [start] about governance, then [followed by] a cry from anarchists." Jauani smiles. "Here we are bumping digital bodies getting in each other's way again." Since we spoke (this was actually an August chat), he's made his own contribution to the social network of the community, employing his architectural skills to create a model home in Dari (154, 173) for a good cause. 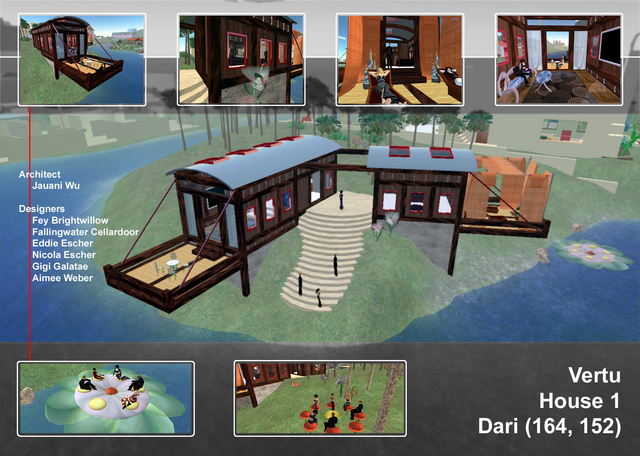 "The hopes are that this project, which by my estimates involved at least 100 human hours [by] some very accomplished SL designers, some of whom are real life design professionals, could accomplish several goals," including an attempt to lift the quality of in-world dwellings toward a more professional standard, and ultimately, to benefit Florida's hurricane victims via VERTU, after the home is sold at auction, and the profits donated (pictured below). "One of the things that keeps me around is to see where is this going," he tells me. "I think alot of people are on the edge of their seats just to see... Already a couple of people are selling real life merchandise [in here] but it's [just] Second Life T-shirts. But what if I started soliciting real life clients for real life houses through Second Life? "I think the game will just change based on population size. The community is very different now than it was a year ago. So right now certain things are important to the players, but what will happen when the population is 500,000? Maybe people will suddenly push for some kind of representation." Jauani Wu turns to me, musing. "Maybe Philip will have a country?" » Adderall online pharmacy. from Adderall dosage instructions. » Potent lortab percocet darvon. from Buy percocet and greece. Interesting stuff indeed. I really like the notation about public spaces and humans as social animals. One other thing about future that i'v been thinking is what will happen when we'll emerge eyeclasses and computers. After this we can see digital content in real life. For example you can put digital poster or art work on a wall, and when you look at the wall through thease classes you can see the poster just as if it were real. One intresting result of this will be transforming objects that define our home into digital format. After this we can carry our home with us everywhere we go, and some need for own real home will disappear. Also when more and more of our interactions will happen in digital world, and when we can carry this digital world with us everywhere we go, i think this will lead to new bloom in public spaces. After this we can be fysically in public spaces, but we will always have the backdoor open for us to escape mentally in pretty much any realm that we would like to. Hmm... The size of the picture seems to mess up the layout of this weblog. Urp. What kind of browser are you using, Jussi? Both Firefox and IE goes strange, though differently. In IE end of every line in my comment goes off the "screen" (white area). And in Firefox the same happens from the beginning of every line (and no white backround behind comments). Jussi is correct from my end too, Hamlet. Odd. I'm viewing in IE and it looks fine. Lemme turn the last pic into a thumbnail, see if that helps. I probably can't do anything with the comments section format, alas. You fixed it, Hamlet! Turning it into a thumbnail fixed the comments section too. Make a mental note for future articles. Thanks from me (and probably Jussi as well). Side note: Maybe it has something to do with auto-resize? I NEVER have auto-resize image on. Maybe Jussi doesn't either, but you do, and that's where the disparity comes from despite our unilateral use of IE. I noticed that pic is of large filesize for its actual dimensions -- not to mention the original, which was 1-something megs. What's type of JPEG compression is being used on it? not be ideal, but there it is. Honestly, I think SL is very, very fledgling in terms of it's technology, deserving recognition for its execution despite massive limitations. However, these discussions about human interaction, space and social behaviors are older than all of SL's inhabitants. Some long-distance human interaction studies are as old as the telephone and older. Philosophy is, in fact older than written language. That being said, it is my humble opinion that these studies have not shown signs of being too revolutionary in this contemporary "digital" age mostly because it’s almost completely based on RL circumstances and merely draped onto the fledgling world of SL. Basically, I think great importance should be on new philosophers honing new philosophy instead of pre-computer philosophers being heralded as prophets for the digital age. I hope the gentleman featured in this article finds enough footing to start this process for us. Well i suppose the effect of VR-technology in our RL won't be quite that revolutinary, but there are some really intresting visions to think. For example lets assume that in the future everyone will have a weblog-kind homepage and portable computers with internet connection. After this (with some good vision recognition search engines) we will be able to get loads of information about everyone we see walking by in the streets eaven without talking to them. It will be intresting to see what effects this will have in our social behavior. Also in context of Second life its intresting to notice that many of the abilities we will have in future-RL (wich is mixed in VR) we already have in SL, meaning that SL might give us some hints about our future-RL on many different levels. prescription drug online is the perfect resource for people to get their drugs without any hassles or awkwardness. We work hard to make sure you save money every time you shop with us. At our online store, you pay less and get more. Great work done by author.